I recently had a pleasant back and forth with Michael Petrilli of the Fordham Institute on what ails the high school. He was reviewing the recent disconcerting NAEP results that once again show high school achievement is resistant to reform. On this he and I agree. But then he proposed some diagnoses, the latter of which I think is totally off base (an E D Hirsch diagnosis). I strongly agree with his conclusion: it’s high time we better understood the problem of the high school. (Hard to believe that after 30 years of reform that started with me working with Ted Sizer in the Coalition of Essential Schools, we still lack clear answers.) After going back and forth collegially, we agreed to do some walk-throughs together next school year. 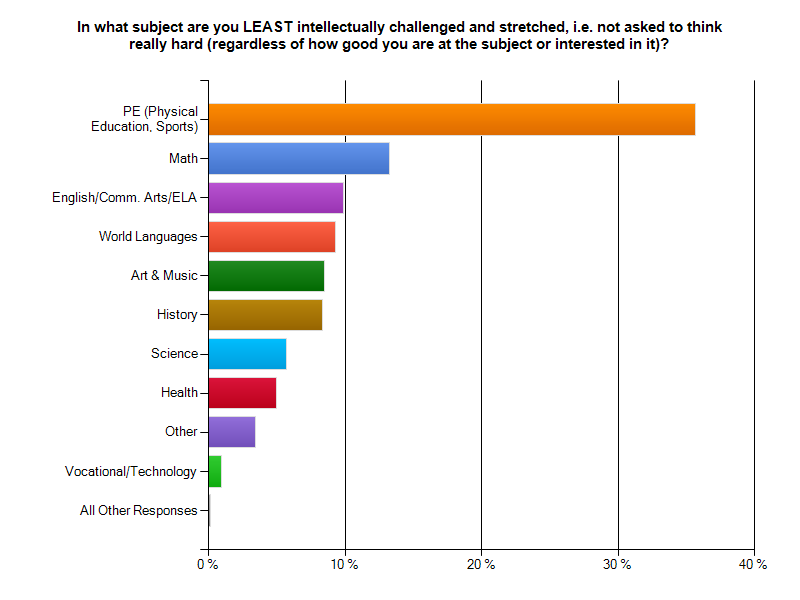 Meanwhile, I can offer a fairly sobering picture of what ails the high school, drawn from our student survey. Below, I have singled out one school. It could not be more typical of the American high school: in a midwestern suburb, mostly white, average size (900ish), with state test scores in the respectable 80+ percent proficient. 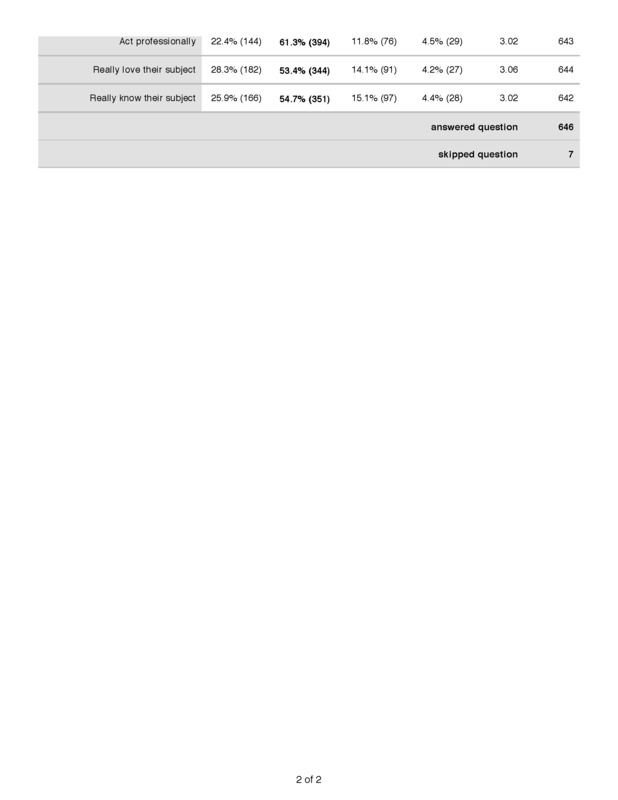 The survey results represent a very large sample – approximately 2/3 of all students, and, as best as I can tell from comparing the demographic data, a very representative sample. Below, I provide the data. In my follow-up post, we look at student constructed responses. What is the typical GPA? And how hard is school for you? 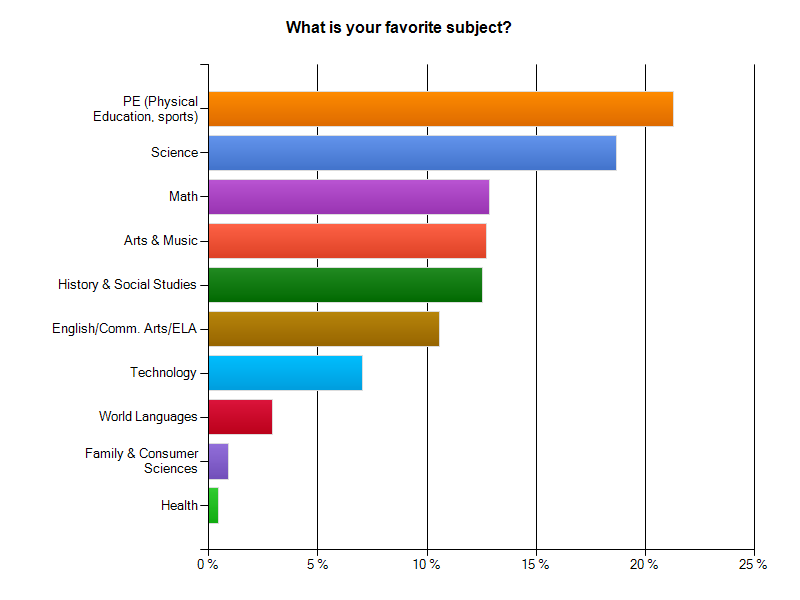 What is your favorite subject? Surprised? You shouldn’t be. John Goodlad found the same thing 30 years ago in A Place Called School, and our surveys have had PE at #1 every year. Nor should it be a surprise that Science and the Arts are ranked highly for the same reasons. (We will of course want to understand better why this is so). 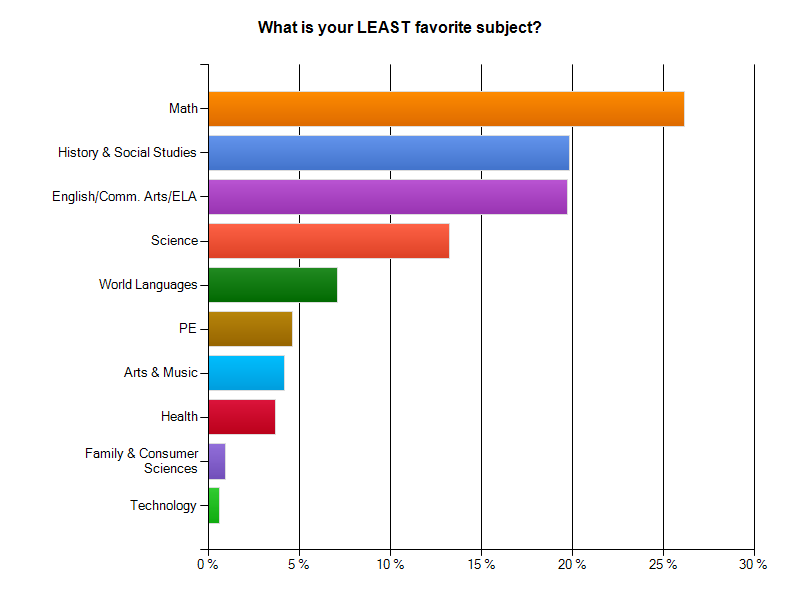 What, then are the least favorite subjects? No surprise there if you consider most kids’ experiences. 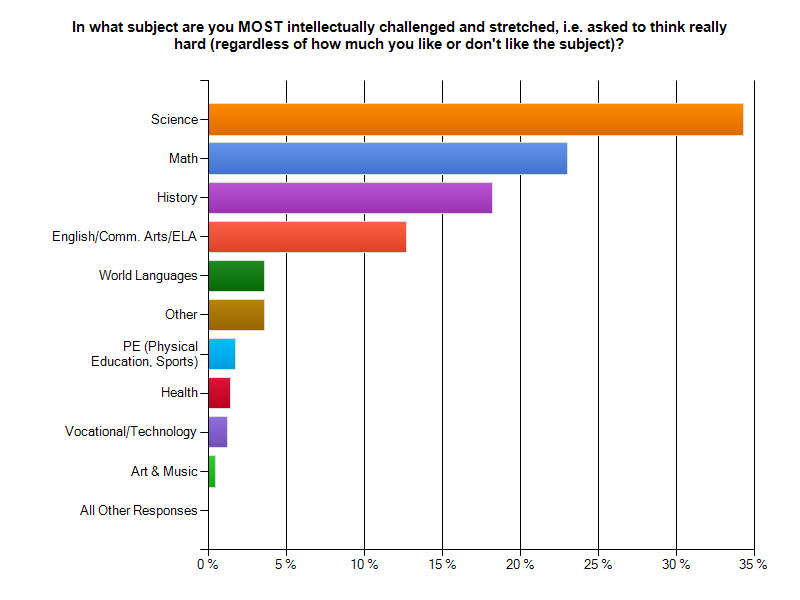 What is of course noteworthy is that math was the 3rd favorite – and this is a consistent finding in our survey. It’s very bi-modal: you either love math or you hate it, and many more people hate it that love it. (More on the reasons, below). Alert readers will no doubt respond: maybe math is just the least liked but not hated at all. Well, we factored that issue into the survey. How negative is your feeling about math? The Science response is interesting in light of the fact that it is one of the more highly like subjects: engagement and rigor are not opposites. The ELA/English response is, of course, worrisome. (More in the follow-up post). Now, what about boredom in general? 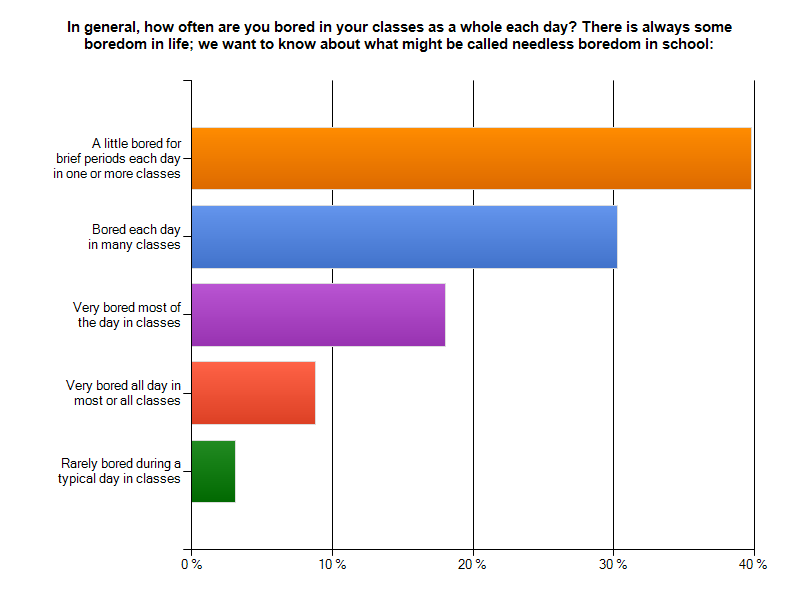 Worrisome – but not surprising, if you have followed my survey results and the National Study of Student Engagement. 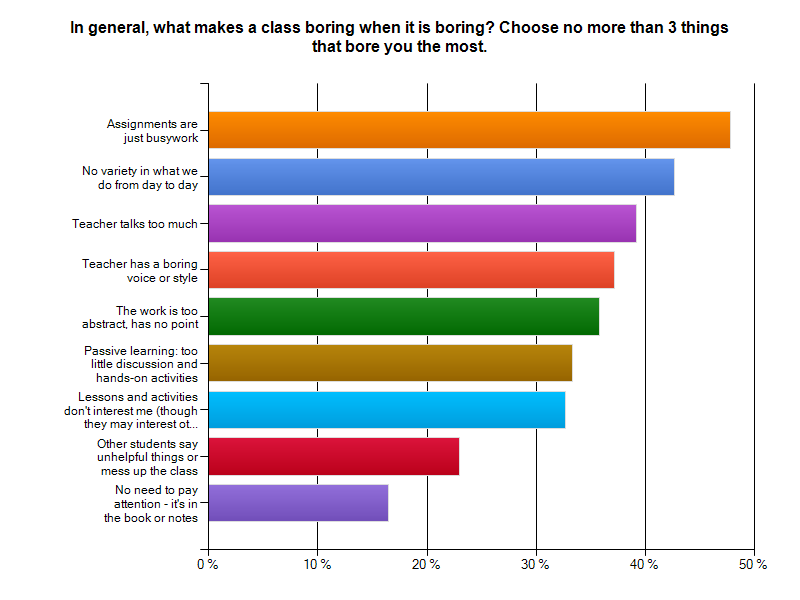 What makes the class/work boring? Finally, what about the teachers’ approaches and attitudes? Most worrisome, only half say teachers know them – a key indicator in Gallup’s study of student success. 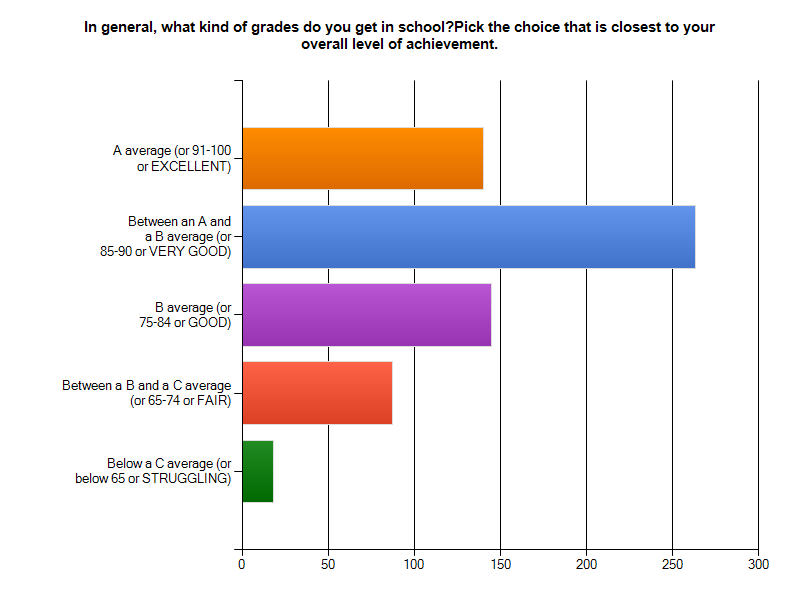 By the way, this school’s profile is NOT representative of the best schools in our survey. On those, as with all questions, no survey question in this list gets a majority of student disagreement. More telling are the constructed response answers, as you’ll see next time. Students were asked to explain why they liked and disliked subjects, what was the most interesting work they have done this year, and if they could tell their teachers 1 thing to make school better, what would it be? In my follow-up post we’ll look at those responses in light of these graphs because they shed important light on the meaning of the numbers. That said, you can probably already answer the question: if this is a ‘typical’ high school – and it is – what is the problem statement?